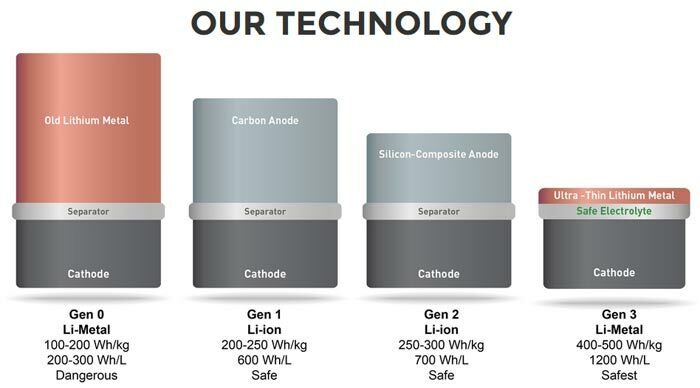 MIT spinoff company SolidEnergy Systems has announced it is ready to commercialise its Li-Metal battery technology. The firm asserts that its batteries offer double the energy density of the lithium ion batteries commonly used to power most electronic devices nowadays. The first SolidEnergy Li-Metal batteries will become available in drone power packs, launching in November 2016. However, there are plans to supply these new high energy density batteries to makers of smartphones, electric cars, wearables, and other devices. SolidEnergy Systems was founded in 2012. SolidEnergy Systems founder and CEO, Qichao Hu, spoke to MIT News about the potential offered by the new Li-Metal battery technology. "With two-times the energy density, we can make a battery half the size, but that still lasts the same amount of time, as a lithium ion battery. Or we can make a battery the same size as a lithium ion battery, but now it will last twice as long." The new battery "essentially swaps out a common battery anode material, graphite, for very thin, high-energy lithium-metal foil, which can hold more ions — and, therefore, provide more energy capacity," explains the report at MIT News. There's another bonus to the new technology – it is said to be safer. 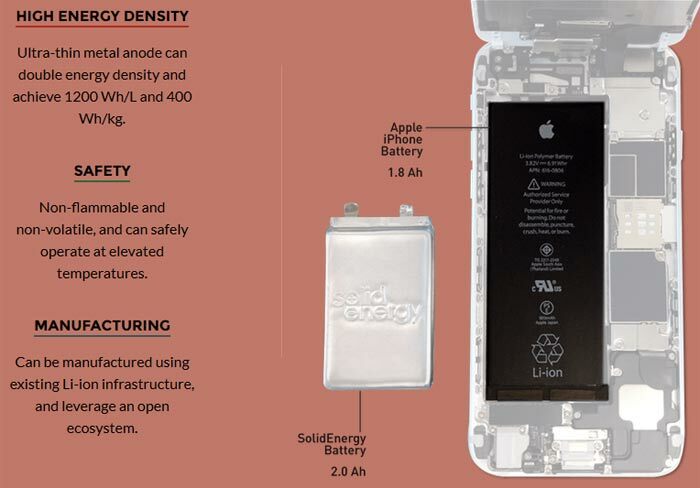 On the SolidEnergy site you can see a prototype battery built to replace an Apple iPhone battery. It offers 2.0Ah and is approximately half the size of the iPhone 1.8Ah Li-ion battery pack. On the topic of smartphones, SolidEnergy plans to roll out batteries to this market, and to wearables, in "early 2017". Of course electric vehicles could greatly benefit from a doubling of their capacity/range. Alternatively manufacturers have the option to make the vehicles smaller and lighter. Could this help bring an end to EV range anxiety? It's good to see a new battery technology that is so close to becoming a marketable, shipping product. There aren't any pricing indications provided in any of the blogs, reports, or slides I looked at. However it was encouraging to hear that "the batteries are made using existing lithium ion manufacturing equipment", which should keep launch prices reasonable. Below is a BBC report that looked at SolidEnergy's technology in development last year. Calling it right now, if this tech reaches iPhone and Galaxy, they will opt for thinner phone over double battery life…..
Finaly they do something to get a better battery, good to hear that. Is it too much to ask for decent-quality battery tech? I for one, would like thinner phones.. Lighter, & harder to break if they were lighter, potentially easier to hold, & would be like normal phones with a good protective case. I want this for the Nintendo NX !! !